Any way, on to the looks, first up is monochrome. 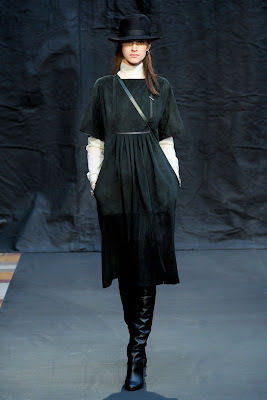 Seems very appropriate to feature this look from the Parisian week as it is how the city that coined the concept. Think monochrome, think Chanel (who, ironically were one of the only fashion houses not to feature the concept in their collections) think little boucle jacket and big, thick mascaras - you can also probably imagine an Eiffel tower in the background too... As you can see the look was mastered in several different ways - Marant, Ricci, Celine and Lanvin all had black skirt and white top combinations. 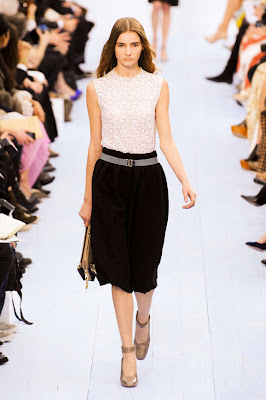 However, they were all done differently - Marant went a little Western rocker chick, Nina Ricci kept it notoriously neat and tidy, Lanvin went (unsuprisingly) down the structured route and lastly Chloe went purely classy (and fabulous). 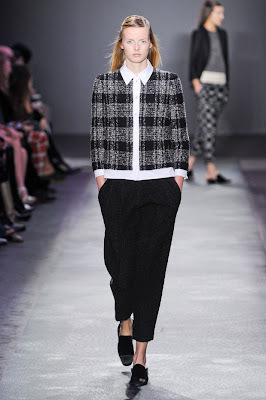 Some names (above) copied/mirrored the London Fashion Week trend of tartan/checked prints. 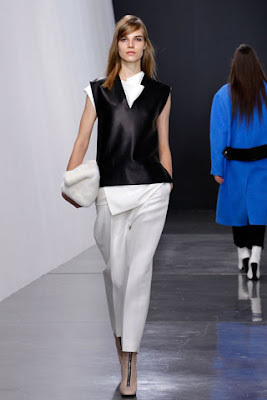 The usually flamboyant Giambattista Valli kept their pieces very simple - grey, white and black fused together by the prints, again mirroring the London Fashion Week trend of white collars as stand out outfit-makers. 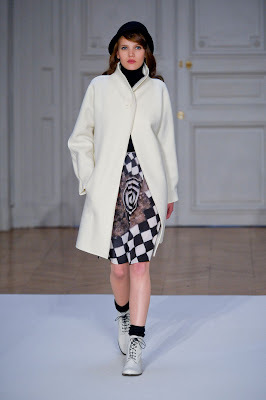 Other houses like Kenzo and Veronique Leroy used textile wool prints to 'excite-up' monochrome outfits - letting texture and skill do the talking. Monochrome is a very bold way to say to the market 'I don't need colour and fuss to show my skills, I am very good at this fashion malarky' (or so I think). Generally speaking the look was everywhere - my favourite was at Stella McCartney (above) who put this white brocade-style dress into their otherwise bold, bright, (blue) collection. Pure class. Lots of collections had pilgrim elements to them, Hermes as above for example. Little black hats were on several runways too - Charlie Chaplin style to give a 1920s air - or prairie shaped for a country theme. Interestingly, it was rarely used to demonstrate androgyny - as it was in AW11 - only Givenchy and Sacai really did 'tuxedo' themed outfits. 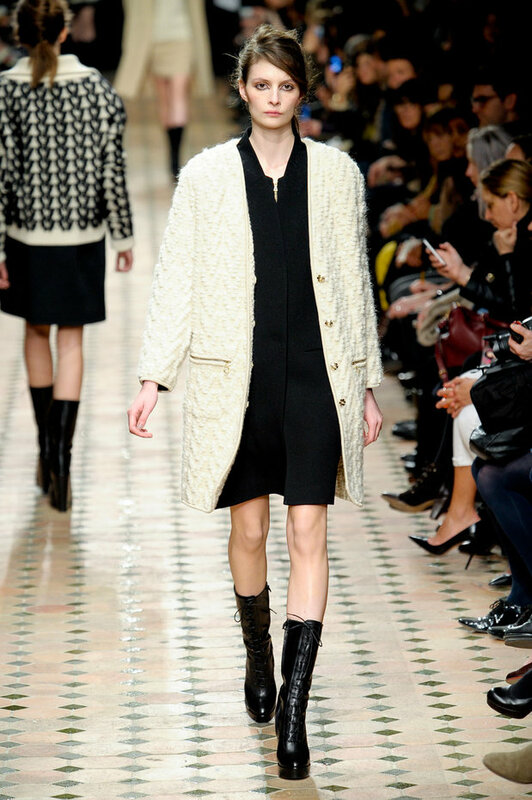 Carven, Chloe and Celine did lace or brocade - again far less than last year. Finally, white coats featured a lot - Agnes B had several as did Veronique Leroy and Victor and Rolf (lovely to know, as white jackets are big for spring summer too, so worth an investment). Overall, you really wont go wrong with black and white outfit this winter - simple class and sophistication is back! Love the name of your blog, it's actually one of my favourite shopping streets ever! 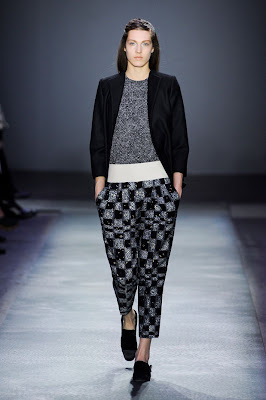 My favourite is the Isabel Marant.